Early Warning Scores (EWS) have been used for many years in-hospital to identify deteriorating patients and rapidly intervene. Ambulance services in Scotland and Qatar have been using an EWS in the prehospital setting. Scotland Ambulance Service uses it as a tool to identify deteriorating patients (including Sepsis), notify receiving facilities early, and initiate treatment. Hamad Medical Corporation’s Ambulance Service is a tiered EMS system and uses the EWS on the ambulance to quickly identify deteriorating patients which triggers an expedited transport and a request for a critical care paramedic intercept. 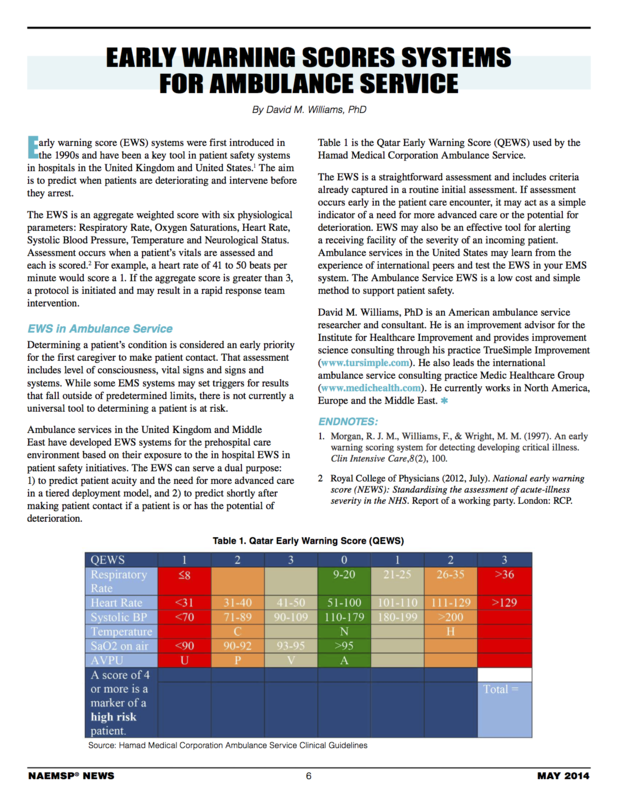 Below is an article I wrote for the National Association of EMS Physicians News in May 2014 profiling the Qatar Early Warning Score (QEWS).